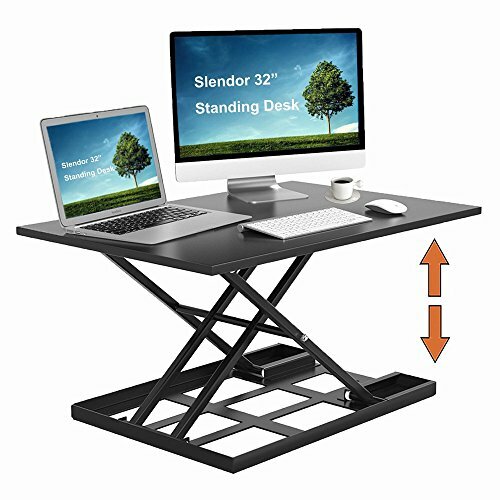 Slendor standing desk converter creates a healthy workspace right where you stand with our portable sit stand desk.The slendor sit stand workstation fits on top of your existing desk, arrives fully assembled, and easily transitions from sitting to standing. Just open the box, put it on your desk, and boom,you are now standing! Enjoy our desk riser for use around your home or office. Max load on is 30 lbs. Standing desk converter,easy to sit or stand.Sleek, ergonomic design,it goes up and down with ease in a matter of seconds, with premium pump assisted lift.The height adjustable desk is extremely easy to operate even with heavy loads such as dual monitors.It allows for ease of use when raising/lowering multiple times a day. Our desks are tested for over 10,000 rise & drop sessions to last a long time. Sit stand desk with egronomic height range,the fluid height adjustment allows more than 200 height adjustable positions according to your comfort.With a maximum height of 17 inches above your current desk, it can be used by people between the height range 5' to 6'3" with either a desktop or a laptop. SITTING IS THE NEW SMOKING - Concerned about your health and wellness? Science continues to show the health threats of prolonged sitting, tying a sedentary life to heart disease, diabetes, and more. Use our elite standing desk to prevent any of these misfortunes and increase health benefits. FULLY ASSEMBLED -Our adjustable desk riser does not require any assembly or desk restructuring.Just open the box, place your computer, mouse and keyboard on top of the slendor desk with 5 minutes,and start standing, enjoy the health benefits of sitting less and standing more! At the surface size 32" x 22",the desk converter supports up to 30LBS, and gives you plenty of space to work with, allowing two 21 inch monitors with ease. 100% MONEY-BACK GUARANTEE - Slendor standing desk are backed by 100% guarantee that you are fully satisfied with your product or receive your money back. Please contact us if have any problem, our aim is to make every customer 100% satisfied with the standing desk. If you have any questions about this product by Slendor, contact us by completing and submitting the form below. If you are looking for a specif part number, please include it with your message.